Necessary qualification required for each post, view in advertisement. The candidate should be a Graduate/ post graduate with minimum 5 years of relevant business/marketing experience (candidates without the required academic qualifications but with exceptional practical experience will be considered). 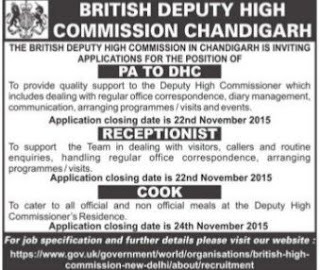 The candidate should be Fluent in English; good working knowledge of Hindi and Punjabi. Previous experience of working as a PA or Executive Assistant an advantage; willingness to learn and develop is essential. Strong team working skills with ability to build co-operative working relationships both within own network and with a wide range of external contacts. 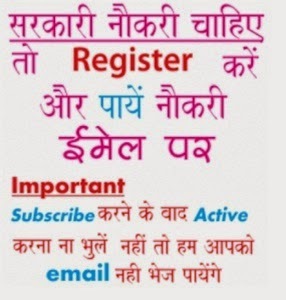 · Fluent in English (both spoken and written) and Hindi; ability to converse in Rajasthani. · A recent and relevant knowledge of the State. The ideal candidate will live in the region, be well networked and understand local business and politics. · An accomplished net worker who can quickly build a broad selection of senior contacts, understand what makes them tick and influence them. · Solid representational skills, someone who can represent the High Commission at meetings and events including public speaking engagements. · A self-starter with proven energy and initiative in overcoming obstacles and the ability to handle multiple tasks and priortise with minimal supervision. 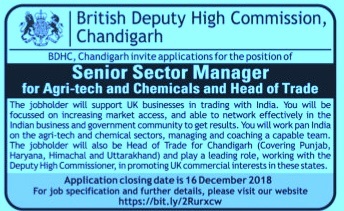 · Excellent team working skills with a strong ability to build co-operative working relationships across our own network and outside of the Deputy High Commission with a wide range of organisations. · Fluent in English (both spoken and written), as well as Hindi and/or Punjabi (with a good working knowledge of the other). · A proven track record in networking, communicating and delivering results. · Ability to work on own initiative (a self-starter) and take responsibility for decisions. · Ability to think innovativ and creatively and willingness to try new approaches and working methods. · Good understanding of the business profile, climate and practices in Northwest India. Professional experience in the education/training, research and/or healthcare fields in Northwest India would be an advantage, but this is not a specialist position and the right personal qualities are more important than specialist experience. · Fluent in English (spoken and written); good working knowledge of Hindi and Punjabi. · Previous experience of working as a receptionist and/or in an office is an advantage; a willingness to learn and develop is essential. · Proven energy and initiative in solving problems, and the ability to handle multiple tasks and prioritise with minimal supervision. · Strong team working skills, with ability to build co-operative working relationships both within the office and with external contacts. · Polite manner and good interpersonal skills: although the BDHC provides limited public services, for many members of the public the Receptionist will be the face of the BDHC and will be a major factor in determining their impression and experience.